The Green Spark Plug Company stock a wide range of Durite battery chargers such as automatic automotive battery chargers for all lead/acid batteries (sealed for life, gel and maintenance free) with either ring terminals, crocodile clips or cigarette lighter/DIN plug. 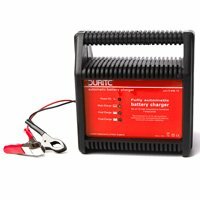 We also stock automatic automotive battery chargers for all lead/acid batteries (sealed for life, gel and maintenance free) with additional features such as micro chip controlled three stage charging so the charger can be left permanently connected without harming the battery and supplied with crocodile clips and leads. There is also the heavy-duty bench start assist/charger with charge timer with ‘automatic’ or ‘manual’ and ‘hi’ or ‘low’ charge rate options or the trolley manual start assist/charger with voltmeter, ammeter and thermal auto-reset overload protection.